Vancouver, B.C. – June 19th, 2018, Tractor Everyday Healthy Foods is expanding to and is excited to announce the opening of their sixth restaurant located in downtown Toronto’s bustling business district on June 25th. Tractor Everyday Healthy Foods is driven to make healthy eating accessible to busy urbanites on the go. Offering a menu of fresh, locally focused meal options served up in a modern cafeteria-style restaurant, Tractor successfully combines style and convenience without sacrificing food quality. This signature dining experience will now be available in Toronto at the new 70-seat Tractor at 151 Yonge Street. Tractor Toronto will be open seven days a week for breakfast, lunch, and dinner and will feature a full cappuccino bar. The Toronto location is the sixth Tractor restaurant and the first outside of Vancouver. The decision to expand into Toronto was inspired by the fast-paced lifestyle and appreciation for health and wellness that the two cities share. Toronto holds a special place in the hearts of owners Meghan and Steve Clarke who lived and worked there prior to moving back home to Vancouver. They have fond memories of the city’s vibrant energy and are excited to share their vision of healthy eating with Toronto diners. The opening of the new restaurant also coincides with Tractor’s five year anniversary. At the heart of Tractor’s mission to improve access to healthy food is their commitment to freshness and quality. Each location is equipped with an onsite kitchen team who prepares food from scratch daily using locally sourced ingredients whenever possible. Head Chef Christian Ibacache, along with a core team of Vancouver staff, will open the Toronto location and uphold the values on which the restaurant was founded. Ibacache has played an important role in Tractor’s culinary direction for the past three years and will now lend his expertise as General Manager of the new location. The menu style will remain the same as the Vancouver restaurants and offer diners the option to either build a custom bowl from a selection of hot and cold fresh market sides (with a heavy emphasis on vegetables) or order a-la-carte from the choice of house made soups, stews, salads, and sandwiches. 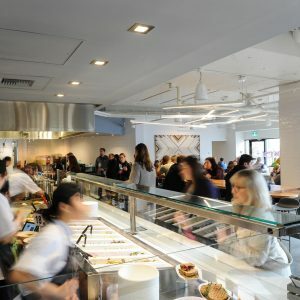 Tractor’s full-scale kitchens aree quipped with a grill, so that customers can add a protein to their bowl such as grilled albacore tuna, wild coho salmon, chicken breast, or organic tofu. Hot options include Tractor’s signature grilled avocado, a menu staple at the Vancouver restaurants. The Toronto restaurant will also maintain Tractor’s signature modern design aesthetic; bright, open-concept dining spaces accented by natural wood and stone elements. Centrally located in Toronto’s business district, the new Tractor invites downtown dwellers and working professionals alike to enjoy a healthy meal in a beautiful setting. Diners can choose to avoid the lunch rush lines by pre-ordering their meal through the Tractor Foods app, available on iOS and Android.